Individuals who are unaware of the price do not derive more enjoyment from more expensive wine. In a sample of more than 6,000 blind tastings, we find that the correlation between price and overall rating is small and negative, suggesting that individuals on average enjoy more expensive wines slightly less. For individuals with wine training, however, we find indications of a positive, or at any rate non-negative, correlation. Our results are robust to the inclusion of individual fixed effects, and are not driven by outliers: when omitting the top and bottom deciles of the price distribution, our qualitative results are strengthened, and the statistical significance is improved even further. Our results indicate that both the prices of wines and wine recommendations by experts may be poor guides for non-expert wine consumers. The post also generated lots of interesting comments. It got me thinking back to when I first started drinking wine. 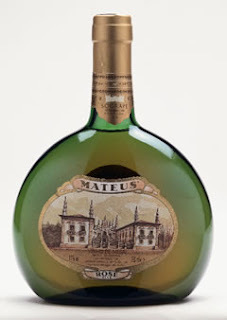 To me, there was nothing finer than Mateus Rosé. That was back in college. Then I remember going to Lawry’s and having a carafe of Gallo Pink Chablis, which was one of their house wines. I thought that was marvelous. I’m not joking, either! Later on I became more adventurous after discovering Trader Joes. I remember Callaway Fume Blanc, Callaway Chardonnay, and then from there, trying a bunch of different things. I have to say that these wines, which I think I’d be safe in assuming most people would call a “step up” from Mateus, Lancer or Gallo plonk, took some getting used to. They weren’t immediately likable by me in the sense of having a revelation that here was what I had been missing all these years while I was instead drinking the "cheap" stuff. I’d say the same holds true for me as I moved up the food chain when growing up. I used to hate shrimp until for some reason I got hooked on it and would hide the shrimp tails under my plate and lie to my mom about how many I had eaten so I could get more. I thought raw fish was repulsive at first. My mom used to make all meat well done to the point of it begging for mercy so I found red or pink beef an oddity and also had to get used to that. But once I got used to those things, there was no turning back. I left my own comment on the Vinography post, suggesting perhaps that ignorance is bliss. We grow accustomed to something and find it perfectly satisfying until we are introduced to something fancier or more expensive. I used to think it was ridiculous to award huge alimony payments when famous people got divorced. People can live on much less, I said. That is true, but these spouses who got the alimony had grown accustomed to a certain style of living and thus would get withdrawal jitters like a junkie if forced to go back to a more humble lifestyle. Is that how it is with wine? Some people love drinking the “cheap” stuff and are perfectly happy, whereas some must have the more expensive stuff and wind up spending a good deal of their disposable income towards that pursuit. Is either one of these groups more or less happy than the other with what they have? Changing the subject, I don’t know how many, if anyone, have been reading my ongoing blogella, The Case. I know yesterday’s chapter was pretty long and it really has very little to do with wine. On the other hand, I don’t see how I can fill up a working week writing about wine since I am not in the industry and am certainly no expert. Those of you who have followed this blog know I like to poke fun at various aspects of wine and the industry but you can only write so much before running dry at times. Anyway, I am going to continue my blogella since I enjoy it so much, but have been thinking I shouldn’t torture people by posting it on onewineperweek. Maybe I will put it on a separate site, or maybe if anyone really wants to keep reading it I can e-mail the chapters as they are written. Feel free to post a comment or send me a note if you have any opinion about this. Goldfeather - wah wahhhh wah..